Below is the 2018 season recap for the Tampa Bay Buccaneers. The Tampa Bay Buccaneers finished with a 5-11 record during the 2018 season as their offense was called upon to light up the scoreboards in an attempt to simply keep up with the number of yards and points their defense allowed. 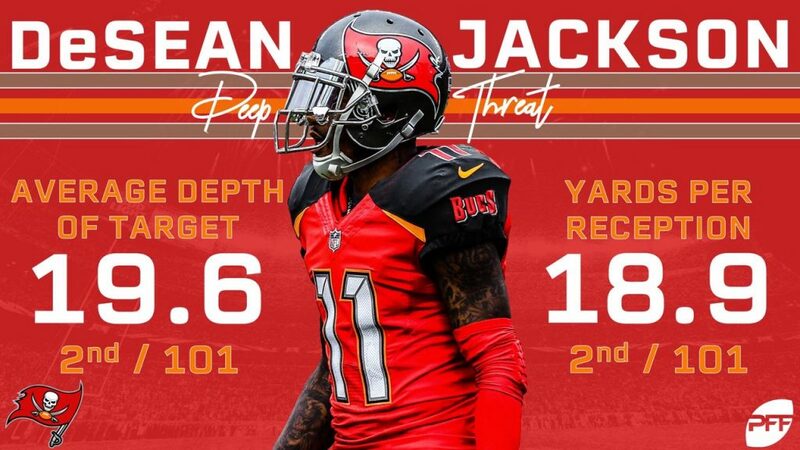 When their offense was clicking, the Buccaneers’ pass-catchers could be seen making one highlight-reel play after another as five of their six highest-graded offensive players were either wide receivers or tight ends. Second-year tight end O.J. Howard was well on his way to a true breakout season, increasing his grade from just a 61.4 as a rookie all the way to an 89.4 overall grade before injury cut his year short after Week 11’s loss to the New York Giants. Rookie interior defensive lineman Vita Vea came on strong down the stretch, acclimating to the professional level with game grades of 67.0 or higher in five of his last six games. He added a pass-rushing skillset to his already stout run defense and found his way on our All-Rookie team along the defensive line. While Fitzmagic was fun to watch, the level of play that 35-year-old quarterback Ryan Fitzpatrick started the season off with was clearly unstable as he put forth game grades of 96.1 and 96.3 during the league’s first two weeks, but he and Jameis Winston could only muster four single-game grades at an above-average level afterward. They bounced back and forth as the team’s starting quarterback without much success. Their quarterback inconsistency only made their deficiencies along the offensive line worse as newly-acquired center Ryan Jensen finished as just the 30th-highest graded center and Caleb Benenoch ranked as fourth-lowest of 88 qualified guards. No pass rush was evident in Tampa in 2018 as Jason Pierre-Paul led the team with 46 pressures but ranked just 30th among edge defenders. Linebacker Lavonte David allowed a whopping 647 yards in coverage, more than all but one other linebacker, as he allowed 87.3% of his targeted passes to be caught. O.J. 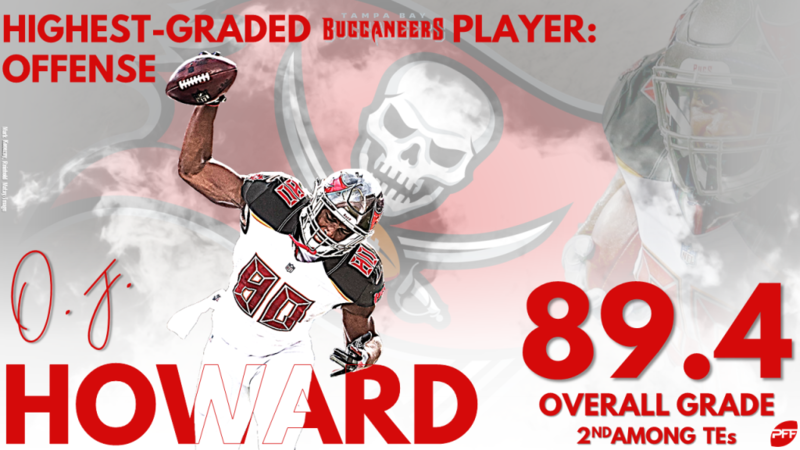 Howard finished as the Bucs highest-graded offensive player and the league’s second-highest graded tight end, behind just San Francisco 49ers star George Kittle. Howard hauled in 34 of the 47 targets thrown his way and gained 6.4 yards after the catch per reception. Of his 34 catches, 28 of them resulted in a first down or a touchdown. 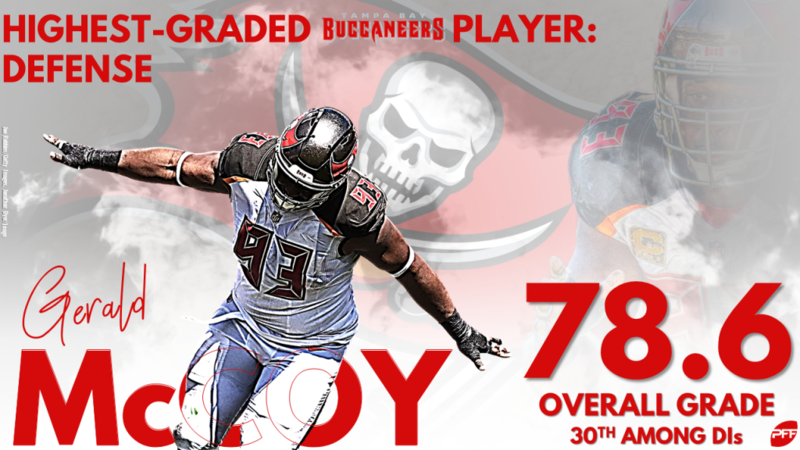 Back at it once again, interior defensive lineman Gerald McCoy finished as Tampa’s highest-graded defensive player. He finished with top-30 figures in both run-defense grade and total QB pressures. 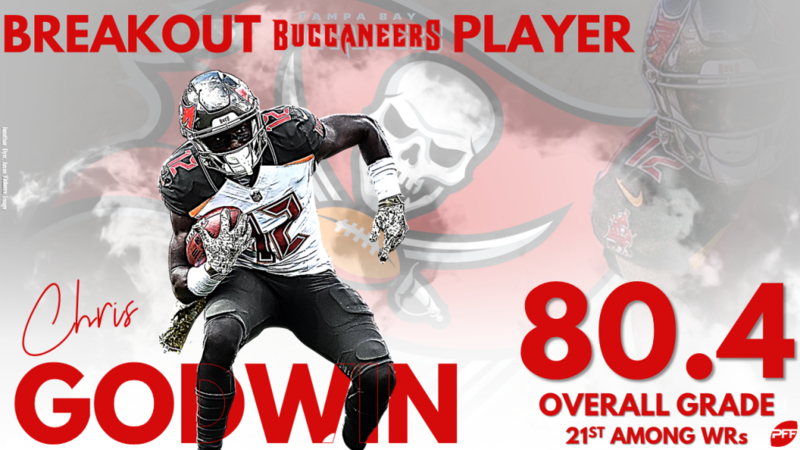 In his second year with the Bucs, Chris Godwin broke out to the tune of 59 receptions that included seven touchdowns and 38 first-down catches. He was a threat after the catch as he broke seven missed tackles and did all of this while dropping just one of the 60 catchable passes thrown his way. 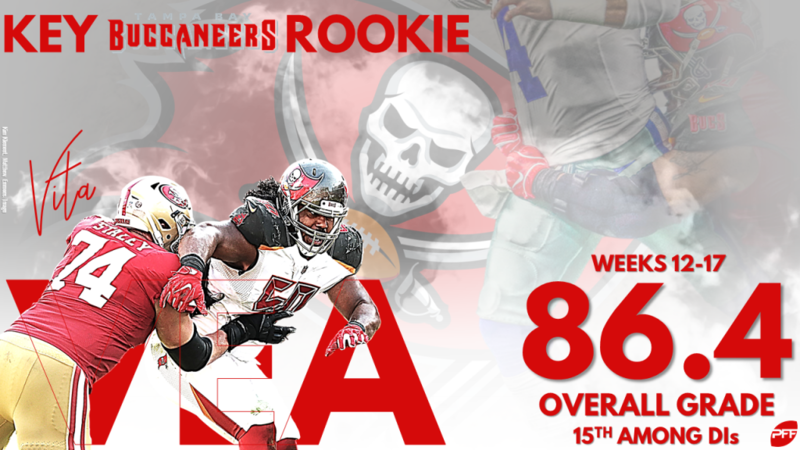 Vita Vea came on strong down the stretch and finished the final six games with an 86.4 overall grade and 19 QB pressures that ranked first among his rookie peers at the position. Inconsistent play at quarterback and deficiencies along the offensive line combined with one of the league’s worst defenses saw former head coach Dirk Koetter out the door. New Head Coach Bruce Arians has some pieces to build around as they move forward in Tampa, but the real question to be answered in 2019 is if Jameis Winston is the long-term answer for the Buccaneers or if the ship has sailed on their relationship.